This page has recently been translated into Polish by Valeria Aleksandrova. You can find that translation here. For a complete listing of the latest rules (version 3.0) click here! Rules are now also available in French, with card translations! These were translated by the very capable Jean-Marc Tribet. 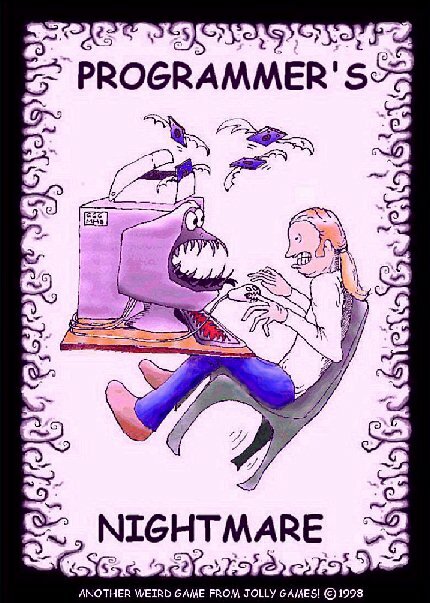 Programmer's Nightmare is available NOW as a boxed set. The boxed set includes 59 cards, rules, plastic "Bit" tokens (tiddlywink chips) for 2 to 6 players. In Programmer's Nightmare, players take turns laying out program instructions with "ownership bits" on the cards they play, creating a long line of interrelating program instructions that become more complicated as the program builds. Finally, a player will play a RUN card and set the program running. Who will survive the convolutions of the program? That's anyone's guess; each player decides if and how their own program instructions will function! This is a fun game, but it does require quite a bit of thinking! It only costs $13, if you want to order it, go back to our order page for ordering instructions. 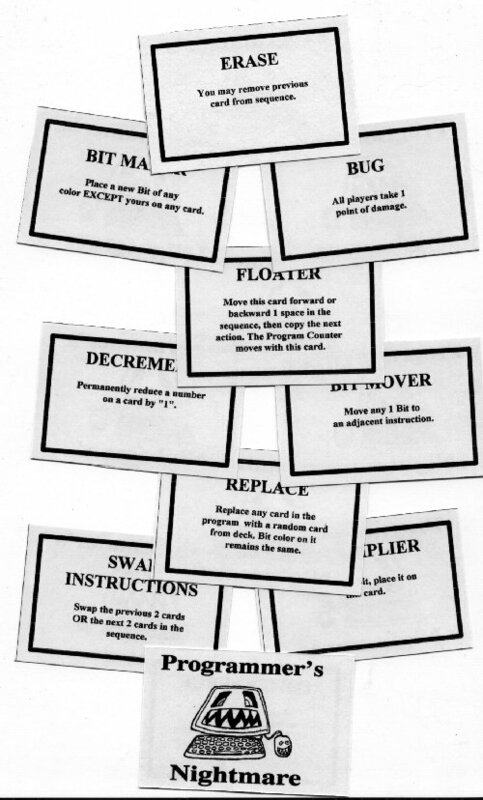 For those with more convoluted minds, there is a "Version 2" of the game in the rules; the program is dealt out at random in a loop, the players take turns claiming instructions that they think will let them win the game. Much of this game's strategy is based upon the initial selection of Program Instructions. To see ordering instructions, go to the Ordering Instructions.